News Corp’s IGN gaming and entertainment property has just acquired Hearst’s gaming and entertainment property UGO, we’ve confirmed with the company. And yes, the move is step one towards News Corp. spinning out IGN as its own property sometime relatively soon, we’re told. This news was first reported by MediaMemo a few days ago as the deal was still being finalized. I got the chance to talk to IGN President Roy Bahat about the news and he wanted to reiterate that while there’s been a lot of talk about News Corp. trying to ditch properties that are underperforming (*cough* MySpace *cough*), this is not the case here. Instead IGN is doing really well, Bahat says, and making money. They will bring in north of $10 million in profit this year, and that number is expected to be significantly higher next year, he says. He also notes that ad revenue is up 30 percent year over year. 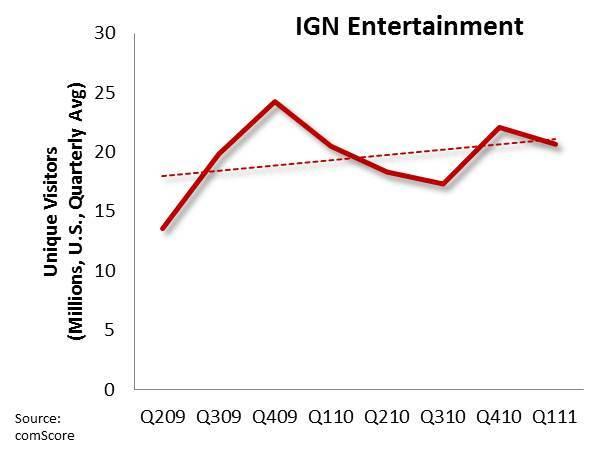 Meanwhile, IGN traffic is up 80 percent over the last two years. The total audience is now 70 million globally, according to comScore. Remarkably, they now reach one in four males online in the key 18 to 34 demographic. And these numbers combined with UGO’s numbers and the spin out are all a part of a “go big moment for us,” Bahat says. And News Corp. is apparently excited that they have a property they can finally spin out and have it succeed. “They’re behind it 100 percent,” Bahat says. And alongside the UGO deal, Hearst will also become an equity holder and board member of the newly combined company. There’s no word yet on how the two pieces will fit together personnel-wise, but Bahat doesn’t expect any major layoffs as a result. Bahat declined to give any specifics of the deal. But we’re hearing that both cash and stock were involved. In terms of timetable for the spin out, that’s still being determined apparently. But you can probably expect it to happen sometime in a few months.